Happy almost 2011! 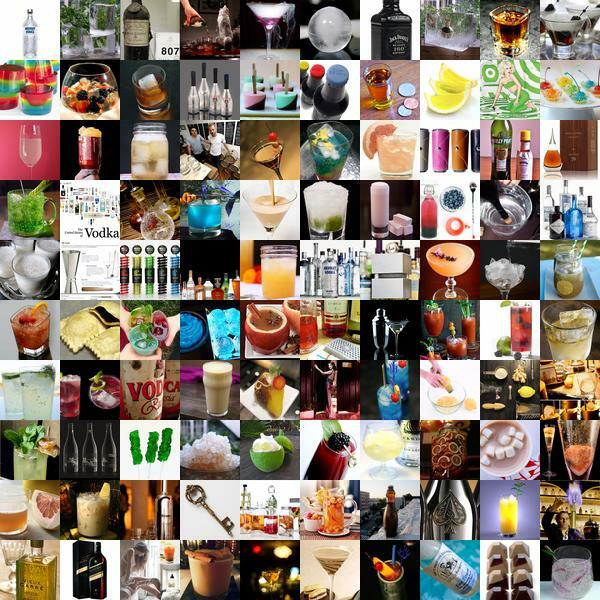 Trying to take a little break the next day or two, so let’s keep going with these Top 100s across the NOTCOT sites… today i’ve had fun looking back on the delicious drinks at Liqurious… i totally forgot about that deep fried BEER ravioli! And those Midori Sour Jello POPS! We’ve definitely come a long way from just making cocktails with our liquors! 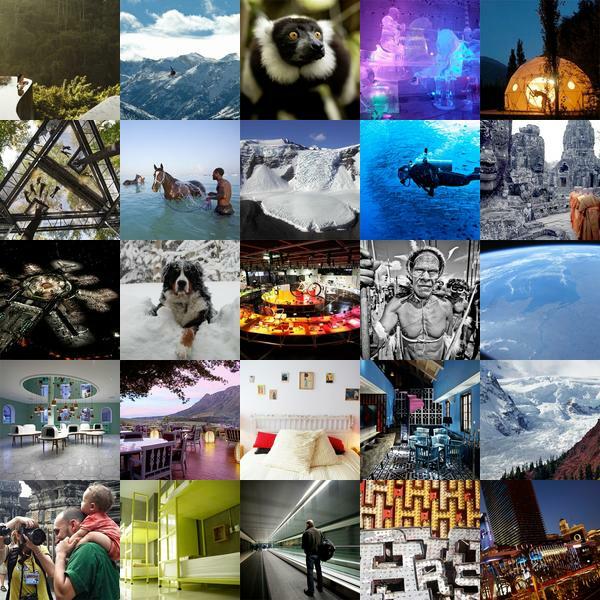 Explore the pics above to see what else we’ve seen in 2010! A look back on 100 of the top posts from NotCouture in 2010! With so much fashion inspiration over the last year, it’s been fun exploring all that we’ve fallen for ~ click the pictures to explore the posts! Montessorium has a new app! Sure i don’t have kids, but having grown up a Montessori kid, their iphone and ipad apps are an instant throw back… tracing the letters on a touch screen, aren’t quite the same as tracing the sand paper letters mounted on colored boards… but the portability and animations are awesome! 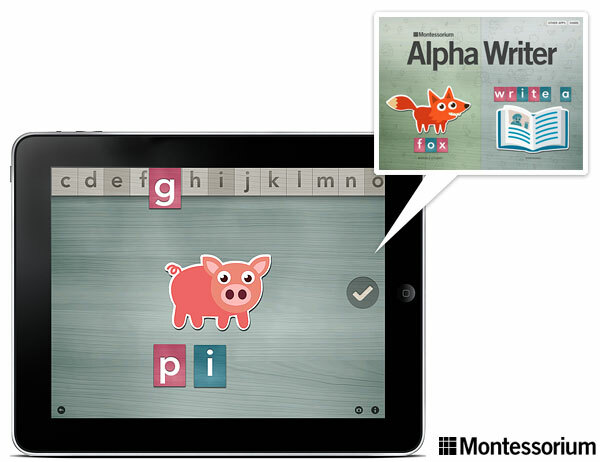 First they launched Intro To Math, next came Intro To Letters… and freshly launched is Alpha Writer! Illustrations are even by Zeptonn! All of them are perfect for toddlers to get to know letters, numbers, and start making words… see some screenshots on the next page. Happy last monday of the DECADE! Phew What a 2010 we’ve had! So many adventures, so much daily inspiration. 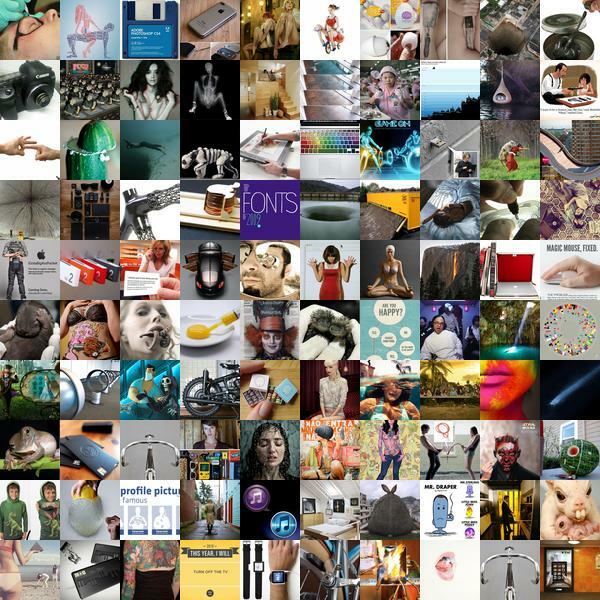 Hard to believe it’s been over 5 years of ideas + aesthetics + amusements… here’s a look back at the top 100 (magically algorithmically calculated) posts of 2010 from NOTCOT.org! We’ve come a long way ~ with nearly 40,000 posts on the front page, the world just keeps on serving up more exciting inspiration! So mouse around the pics, and click to find out more! I’ve just spent a bit of time digging around the archives getting lost exploring it all! Cheers + hugs to you all for supporting NOTCOT through the years! Here’s to an awesome 2010 ~ and an even BETTER 2011! 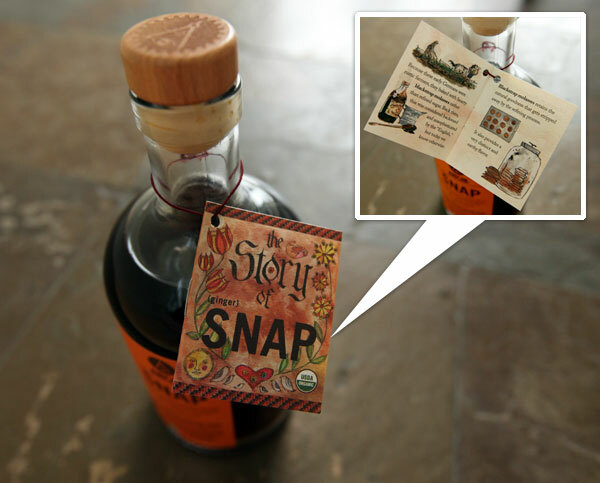 I love when beautifully packaged delicious liqueurs come with nicely illustrated stories around their necks… like the Art in The Age of Mechanical Reproduction SNAP ~ a ginger snap spirit, from the makers of ROOT. Previously i showed you ROOT as well as a sample of Snap in a glass jar we tasted… since the production bottles were not yet ready… This time you can see the finished product! Popping the cork on this bottle, it smells like gingerbread houses wafting out, perfect for this wintry holiday season… the mix of blackstrap molasses, cloves, brown sugar, cinnamon, ginger, nutmeg, rooibos tea and vanilla is just irresistible! Perfect for getting creative with cocktails playing with everything from apple cider to toasty fireside drinks. The story was so cute (and educational!) had to share the booklet details with you… lovely illustrations… check it all out on the next page! Sometimes that Christmas Spirit, comes in a bottle. Apparently for 2010, that was true. And the spirit came in the form of the Green Fairy. And it is delicious, and beautifully packaged, courtesy of Stranger & Stranger… it’s not enough that they make some of the most beautiful alcohol packaging around, every year for the last 12 years, they have also sent out a special Christmas Spirit, and i sip this year’s absinthe as i write this post. It’s delicious. 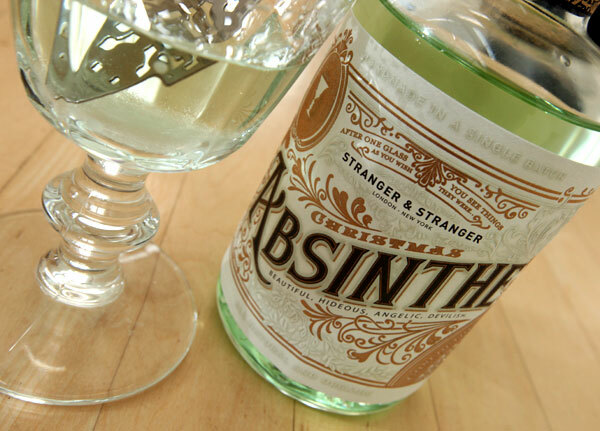 Absinthe handmade in a single batch, not available for purchase… It is deliciously beautiful! When a bottle says “After one glass, you see things as you wish they were.” how can you resist? “Nectar, bitter-sweet - like the last kiss on the lips of a discarded mistress, is the secret charm of my existence; green as the moon’s light on a forest pool it glimmers in my glass; eagerly i quaff it, and, as i drink, i dream.” Marie Corelli, 1890. See the close ups on the next page, and a very merry christmas to you! Merry Christmas - With toys! Merry Christmas! Not sure why i’m up at 4am on christmas… and yes, still playing with toys into the night. Kidrobot sent over a fun christmas surprise ~ The Burglars Dunny by Saner… and the flocked santa beard was so hilarious, i couldn’t help but mix and match the accessories instantly. Doesn’t this Rocketworld guy just look far more distinguished in mustache/beard while wielding his spork? Really, all he needs is a monocle now! And you should see the James Jarvis King Ken snow gorilla with the reindeer skull on a stick! Oh, and the actual Santa Barbaja character too… see it all on the next page! 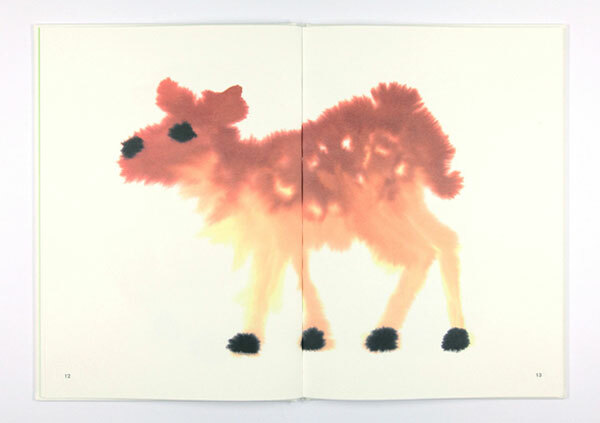 Wilde Dieren/Wild Animals By Rop van Mierlo. Beautiful. Odd. Book of wild animals! That sensation of watching water colors soaking into a page… just getting absorbed so naturally… somehow, Rop has embodied that in this book of strange wild animal paintings… the video really pulls it all together so mesmerizingly tonight, i keep watching it over. See it and a peek inside on the next page! Here are just a few of the beautiful destinations showcased on Notventures this week. Where will you be off to next? To be taken to each post, just click on its image. UPDATE: Congrats to Jennifer in Northbrook, IL! 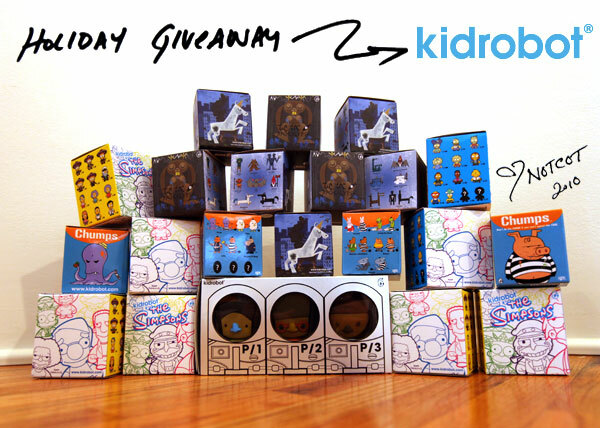 NOTCOT Holiday Giveaway #30 is here ~ and today our friends from Kidrobot are giving away a SECOND giveaway! A Blind Box Tower of Treats from the following series: Amanda Visell’s Tic Toc Mini Series, The Simpsons Mini Series 2, Chumps Mini FIgures, and De La Soul 3 Pack. Aren’t they amazing? 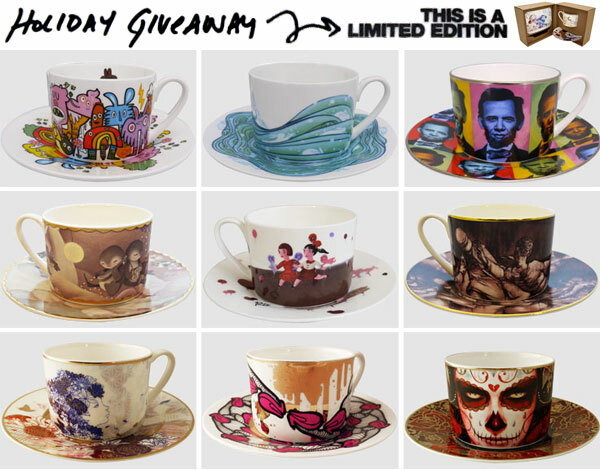 You can see details of each set on the next page (as well as a coupon! )… and honestly no matter what happens this holiday season, there is an inescapable joy and delight to opening a mountain of blind box toys!!! Something deviously fun about the pain and pleasure of not knowing which you’ll get perhaps? 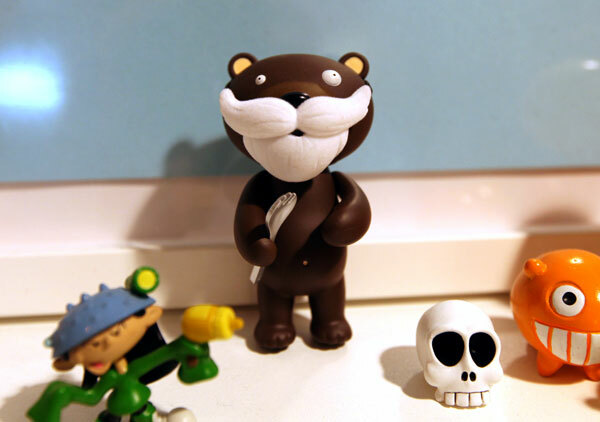 For a chance to win, you can EITHER leave a COMMENT or TWEET @NOTCOT with #2010Toy by midnight on Dec 27th (PST) ~ tell me your favorite toy of 2010 - bonus points (that don’t effect your odds! but just for fun!) if you link a picture of it! This post is brought to you by Old Navy. Thanks, Old Navy, for inspiring me to rant about tech fashion! When faced with writing a post on technology in fashion instigated by Old Navy and their new Techno Hoodies, we went through everything we could find. It’s actually been a fascinating research project of sorts exploring what is happening in the fashionable technology world, and sadly i expected more! We need more wearable tech! Or washable, wearable tech? 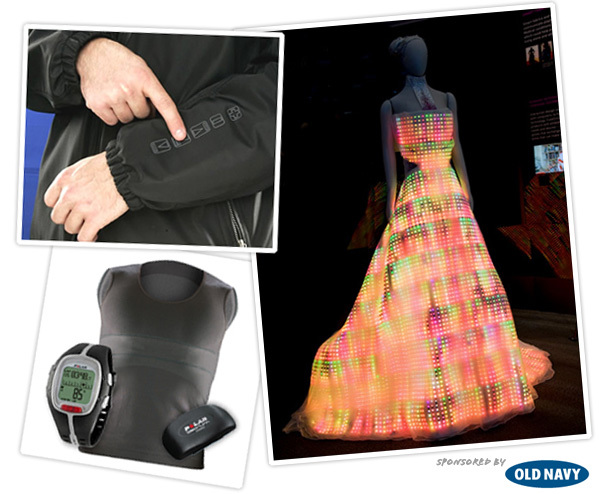 The easy thing was letting my mind wander in and out of scifi movies, combining things i’d find, imagining what could be next… so on the next page you’ll see a few examples of my favorite technology in fashion innovations! Ice balls are definitely a huge 2010 trend! Down to the last week of 2010! 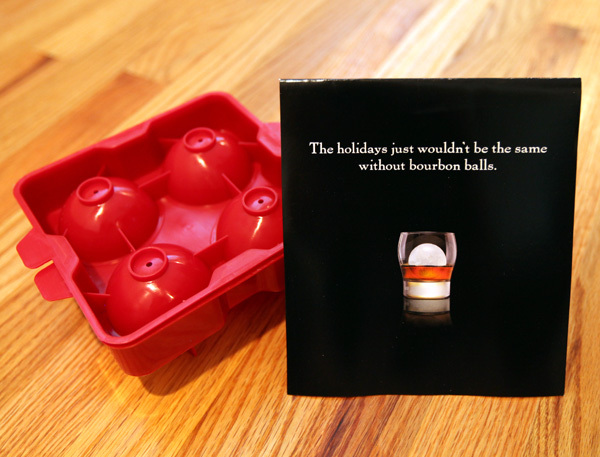 From The Macallan Ice Ball Machine to the Muji Silicone Ice Ball Mold… and freshly arrived from Maker’s Mark, Bourbon Ball Mold! Also i recently acquired some Fred & Friends Brain Freeze ice brains as another ice ball alternative for scotch and bourbon sipping. So check out the Maker’s Mark and Brain Freeze variations on the next page! UPDATE: Congrats to Alan in Hong Kong, Aljosa in Slovenia, Tabitha in Canada, Jacob in Atlanta, GA, Kevin in Los Angeles, CA, Stacy in Walla Walla, WA, Ian in Birmingham, AL, Angela in Clearwater, FL, Mari in Carson, CA, Dan in Tyne & Wear UK, Jörg in Berlin, Germany, and Calvin in the Philippines. 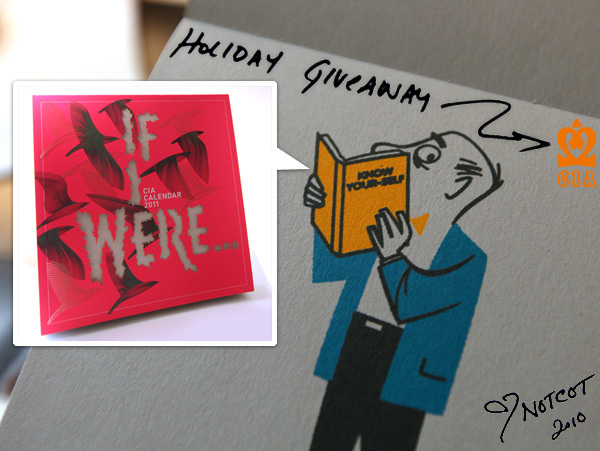 For a chance to win leave a comment by midnight on Dec 26th (PST) ~ sharing one thing (preferably exciting! and inspiring!) you plan on doing in 2011! On new uses for the iPhone/iPad, or old iPhones… love the idea of adding it to your guitar/music gear as your latest super versatile Pedal! This just came in to NOTCOT.org submissions and was so cool it needed a featured post! New Signal Process BreakOut Pedal - “Boutique audio interface for the iPad and iPhone, handmade in Portland, OR by group of artist tech misfits obsessed with Alice Coltrane records and pranking friends.” Made from high quality hardware, it allows you music to be passed through the iPhone/iPad and right through and ready for your amp ~ “It literally breaks out of the iPhone’s headphone jack, so you can use all your favorite recording, signal processing and sampling apps. 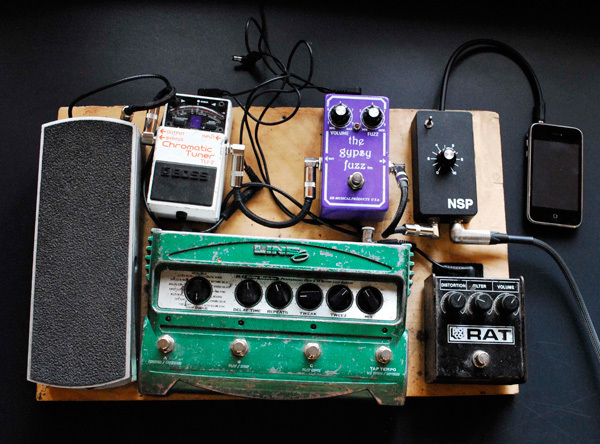 It’s mono design fits in perfectly with effects pedals and amplifiers. The internal circuitry solves all signal, feedback and detection issues you may have sending guitar and line signals in and out of the iPhone and iPad, and allows for a plethora of uses, on stage, in the field, and at home, with guitars, mics, amps, PAs, etc.” Awesome, right? See more pics of the ! New Signal Process BreakOut Pedal on the next page!